Americans have more confidence in small businesses than they do in the government, organized religion, newspapers or the public school system. Big businesses, on the other hand, have done little to instill confidence in the American public. 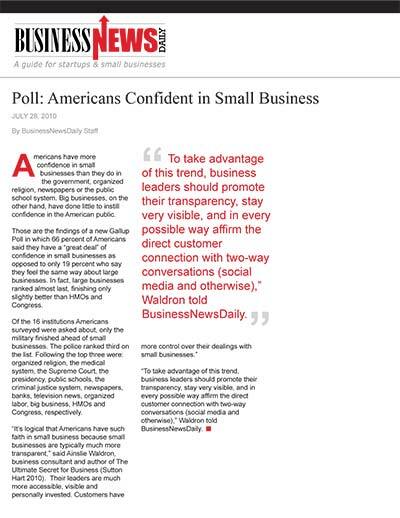 Those are the findings of a new Gallup Poll in which 66 percent of Americans said they have a “great deal” of confidence in small businesses as opposed to only 19 percent who say they feel the same way about large businesses. In fact, large businesses ranked almost last, finishing only slightly better than HMOs and Congress. Of the 16 institutions Americans surveyed were asked about, only the military finished ahead of small businesses. The police ranked third on the list. Following the top three were: organized religion, the medical system, the Supreme Court, the presidency, public schools, the criminal justice system, newspapers, banks, television news, organized labor, big business, HMOs and Congress, respectively. “To take advantage of this trend, business leaders should promote their transparency, stay very visible, and in every possible way affirm the direct customer connection with two-way conversations (social media and otherwise),” Waldron told BusinessNewsDaily.